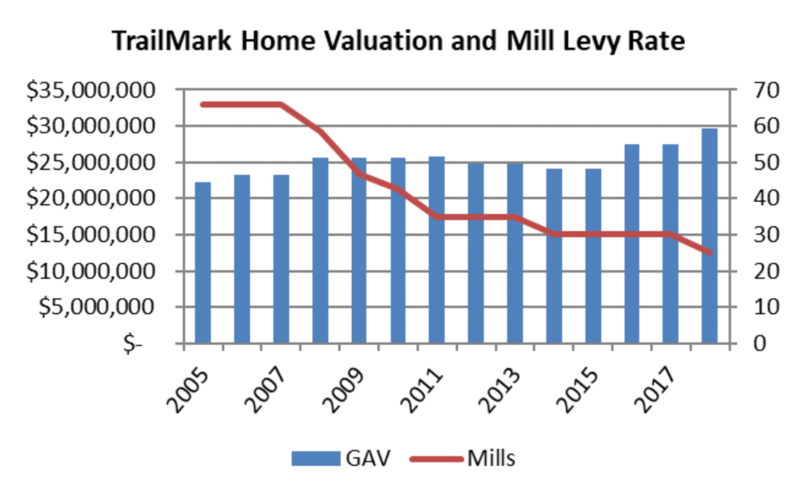 The chart below depicts the annual Gross Assessed Home Values (GAV) and mill levies (Mills) from 2005 to 2018 for TrailMark. ​One mill is equal to 1/1000 of a dollar of the property’s assessed value as determined by Jefferson County. You can find your property’s assessed value by going to the Jefferson County Assessor’s website (http://jeffco.us/ats/specificaddresssearch.jsp). The 2018 Gross Assessed valuation for ALL 799 HOMES in TrailMark was $29,706,437. This is an average assessed home value of $37,179.52. A 1-mill tax upon the average TrailMark assessed value is $37.18 in property tax. A 25-mill tax (the current tax rate) upon the average TrailMark assessed value is $929.50. There may be other exemptions that also could affect your property taxes. For example, a constitutional amendment was passed by voters in November 2000 providing for a Homestead Exemption for qualifying senior citizens. For those who qualify, the exemption exempts 50 percent of a portion of the appraised actual value of the property from property taxes, as determined by the State Legislature. For 2014, 50 percent of the first $200,000 in actual value of their primary residence is exempted. Copies of the annual Mill Certifications can be found below. The 2018 mill levy assessed for the TMMD’s Debt Fund (bond repayment) is less than what is necessary to meet TMMD’s 2018 bond payments. As in prior years, the TMMD has chosen to under-collect the revenue necessary for bond payments and instead utilize excess cash reserves to supplement the shortage of revenue collected for the Debt Fund in 2018. At the November 9, 2017 meeting, the Board authorized an early payoff of the 2018 series bond which will result in a savings of over $20,000 in interest payments that otherwise would have been paid in 2018. For Taxes & Mills from previous years, go to the Document Archive page.